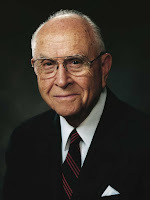 Elder David B. Haight (born Sept 2, 1906, 110 years ago today; died 2004 July 31, 2004) was sustained as a member of the Quorum of Twelve in 1976. He passed away at age 97, four days after attending the funeral of his colleague Neal A. Maxwell. He was the oldest person to have served as an apostle in this dispensation. "It is our responsibility and glorious opportunity to bear constant testimony of Jesus the Christ. We must testify to the world of His godship, the actuality of His birth in the flesh of both divine and mortal parentage. He was selected to perform the essential mission of the Restoration and Redemption. This He did—He was crucified and rose from the grave, thus making it possible for every human being to be resurrected through this marvelous Atonement of Jesus, saint and sinner alike. "All can be placed on the pathway to eternal progression. Everyone who accepts Him and is repentant receives forgiveness of his past sins and the opportunity to gain exaltation. 'I am the way, the truth, and the life: no man cometh unto the Father, but by me' (John 14:6). Could the mind of man possibly develop a more noble concept for the destiny of man? Jesus Christ is the central figure. 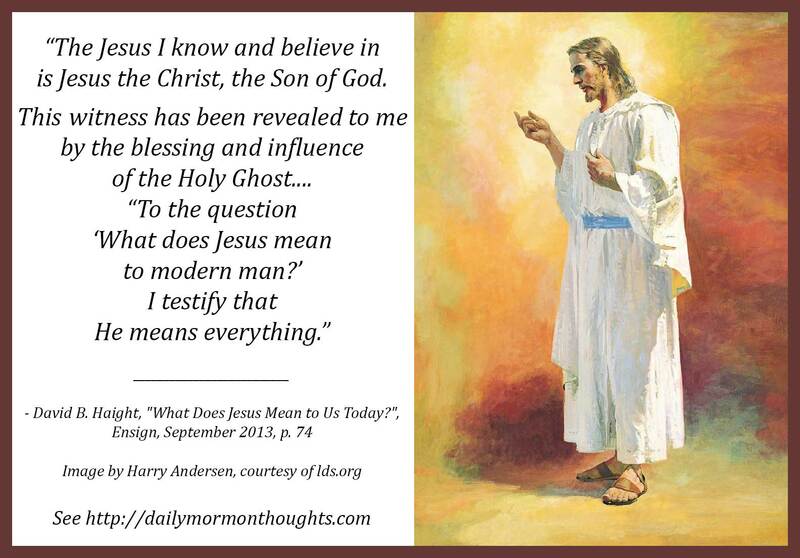 "To the question 'What does Jesus mean to modern man?' I testify that He means everything." This address by Elder Haight shared a very personal witness of the relevancy of the life and message of Jesus Christ for us today. Jesus is "the friend of all, healer of the sick, the giver of peace to all who will listen and believe." Based on His love for us, Elder Haight then challenges us to "bear constant testimony of Jesus the Christ." We should be sharing His message to all the world, so that they might have the joy and blessings that we do as His followers.